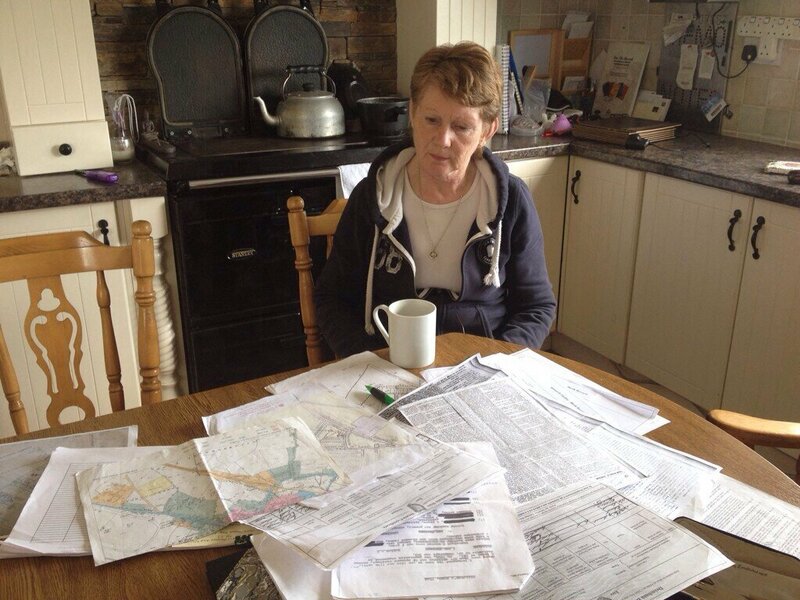 No, my mother has not made any retraction in relation to her findings about the Tuam Mother and Baby Home. No, my mother did not “admit” that anything in her findings was “impossible”. My mother, Catherine Corless, is as consistent as ever in her presentation of her findings; no retractions, no “admitting” to “impossibilities”. There is the old kettle on the range that inspired the name for this sleepy little blog, splashed in images from my parents kitchen all over media electronic and traditional as my mother’s research made headlines the word over. There is my mother herself sitting in her kitchen where she answered telephone interviews and hosted journalist after journalist, representing newspaper, radio and TV, from Ireland, the UK, France and the USA. My mother, who does not ordinarily do crowds of people, or even social occasions if she can help it, or any kind of public speaking, graciously handling intense publicity in the poised, articulate way that she did. She shared generously of her time and her work to speak the story of a group of children whose little young lives were compromised before they were even born, and, after death, whose existence was quietly concealed. These were the children born in seclusion at the Tuam Mother and Babies Home between the years 1925 and 1961, to mothers that a proudly austere Irish community sought to sequester in the interests of religious mores. These were the children who died there. These were the children who were buried in unconsecrated ground, in some kind of crypt arrangement in an area of the property associated with sewerage (recent extensive documentary evidence of the nature of this area by Izzy Kimikaze here). After Alison O’Reilly for the Mail on Sunday broke the story nationally on Sunday 25th of May, there began an incremental media interest, which, almost two weeks later, became a total frenzy in which my mother calmly and patiently repeated her findings, consistently, again and again, to speak on behalf of forgotten babies who had nobody else to speak for them. Meanwhile, my Dad and my brothers took leave from work (granted without hesitation by their employers) to field journalists and photographers on phones, in our house and garden, and in the town of Tuam, whilst my sister sorted emails from her Dublin base and at my parent’s house. I tried to keep up with it all online here in Wexford, mostly at night after the kids were in bed, staying up way past my ideal bedtime. “an eloquent advocate for the children who died in the home over a forty year period”. Yes. Yes to that, I thought. Then this week I notice that I’m getting notifications to my Twitter account about certain commentators suggesting, nay claiming, that my mother “retracted” findings, which I know she did not, so I find myself carving out some time to sit down and write this comment on my blog. I can confirm that my mother was not contacted about this “correction” and the words attributed to her were never spoken by her; they appear to be an interpretation of an Irish Times article by journalist Rosita Boland, which, while it clarified some semantics regarding other journalists’ reporting of the story, also included some misrepresentations of my mother’s position. is itself a misrepresentation – this headline seems to be a reference to the use of that emotive word “dump” which word my mother never spoke in relation to the burials; though the article does clarify this, it is an exaggeration on behalf of the Irish Times to suggest on that basis that “the nature of their burial has been widely misrepresented”. This is false; my mother says she did not “admit” that anything in her findings was “impossible”; she was as consistent in her presentation to Rosita Boland as she was with any other interviewer. So, there is a video accompanying that very article which records that my mother said the word “possible” – not “seems impossible”. Futhermore, I’ve already tweeted my response to the detail in the article about cited “confusion” about maps, and can outline it in more detail here. There was no confusion about maps or their dates associated with my mother. The “confusion” referred to appears to be that of the journalist’s, not my mother’s. The copy of the map that they were incidentally looking at amongst my mother’s documents was the edit from the IRISH HISTORIC TOWNS ATLAS NO. 20, TUAM – Map 13 captioned “Growth of Tuam, to 1892, by J.A. Claffey” – the caption, shown below, seems to have confused the journalist. The map under the colour-coding edits by J.A. Claffey on the particular map they happened to be looking at amongst Mam’s documents is itself a revised edition of the Ordnance Survey 1905-6 mapping, Scale 1:2500. The cited “confusion” is a further misrepresentation of my mother’s work and the interview she gave that day to the Irish Times. “The newspaper” in question here is the Irish Times and the quoted “discrepancies” are false, as I have outlined above. No, Eamonn Fingleton, Catherine Corless has not been “quoted accurately”. And on point of information there, Eamonn Fingleton seems to have given Dr McCormick a promotion to professorship. An “investigation” accredited to the Irish Times? There was no investigation, but for that cross-examination of my mother by an Irish Times journalist, whose article misrepresented my mother, as I have outlined in three ways above. I personally find it dismaying that the Irish Times represents itself here as somehow swiping information from under my mother’s nose as though it had never been considered before, in order to present it in a strange, inconsistent report with no clear bottom-line other than to slate other journalists’ apparent sensationalising of the situation and to seemingly raise doubt about my mother’s work; in between the lines of which, the gravity of the findings were not disputed. I reiterate that my mother remains as consistent as ever in her presentation of her findings. Meanwhile, commentators the world over continue to engage with the details surrounding the situation at Tuam and all of the Mother and Baby Homes whilst we all await news of the Terms of Reference according to which the investigation will operate. I expect continued unsilencing of the very raw and difficult truths of what happened to the children and mothers of Irish Mother and Baby Homes and I wish for this to take place as accurately and as sensitively as possible in what most certainly is and will be an unprecedented pressure of publicity and media interest on anyone associated. And meanwhile, don’t forget that the little committee established in Tuam to commemorate the children who died continue to collect funds. My mother was contacted three times by the Irish Times – twice by Eoin McVey and once by Rosita Boland – inquiring whether she would like to make a complaint about the misrepresentations as outlined in this post. I can report that she has decided that she does not wish to make a complaint because, as she responded to the Irish Times, whilst she is greatly dismayed at the confused and negative impact that the Irish Times piece – among others – has had on the Tuam Mother and Babies Home campaign, she does not wish for any spotlight drawn personally on her. My ordinarily very private, retiring and self-professed-reclusive mother has already put herself on a public stage to a degree that has been astonishing and even alarming to those close to her for the sake of a cause she feels very strongly about, and I support her decision. Rosita Boland wrote to me by courier at my address 4th of July (copy of letter can be seen here). She thereafter sent me a short audio clip at my request. Regarding the sewage tank being in use or not, my mother’s position regarding whether or not the sewage tank was still working in those years is that this is not clear (it may not have been, meaning children registered as having died between 1925 and 1937 may indeed be in that same former sewage area). The audio clip does not refer to this section of the interview. My mother never did claim at any stage that any children who died would have been “put in a working sewage tank”. In this way, I maintain that for Rosita Boland to write “Corless admits that it now seems impossible” (my emphasis) is false because it suggests new information as a result of the Irish Times interview, which is not the case. If the Irish Times article wished to downplay the widely-reported and unsavoury aspect of the sewage tank, they could have highlighted – simply – that at no stage did my mother’s findings suggest that it was a working sewage tank. As my mother is already quoted in the Connacht Tribune, in one of the first-ever interviews she gave about this sad situation, the entire aspect of the sewage tank “is not nice to think about”. In connection – once again – with the “confusion” about maps: the short audio clip records my mother saying the words “that must be a mistake” – meaning the date on the map’s caption of 1892 must be a mistake as my mother knew full well that the map represented – the base map as I have explained in this blog post – could not itself be dated 1892 – just before the clip ends. The audio clip does not reassure me that my mother was misrepresented in relation to “confusion”. Furthermore, though she did know that the map could not of course be dated 1892, if my mother did not immediately recognise what the caption on the map related to and if she did not make this perfectly plain to the journalist in a way the journalist could also understand, I have painstakingly outlined the clarifications in this blog post, in a way that I hope that anyone can now understand. My mother also tells me here today that she went on at that point of the interview to back up her findings relating to the sewage tank to the journalist (using Tuam Herald archival material 1900-1918 containing the minutes of the meetings of the Home Assistance Committee); perhaps the journalist has that conversation recorded also. Despite this, and despite my painstaking clarifications above, the position of confusion about maps is still, to date, clearly maintained by the Irish Times journalist and features editor. While I found the article by the Irish Times journalist jarring and discomfiting to read, even notwithstanding my personal connection to the story, and I found its headline and tagline (which apparently were not written by the journalist) misleading, I do not accept the charge that “public accusations” – mine or others – about a single newspaper article will damage a journalistic reputation in this instance. I have read many wonderfully-written and interesting articles by this journalist before and after the report on the interview in question here; I simply do not number that article among them. To date, I have received no correspondence from any other media publications referenced in my blog post above. Tá eagla ar an Eaglais. Tá sí cumhachtach. Déanfaidh sí iarracht an fhírinne a bhriseadh. I used the word dumped when writing about this for rabble. As far as I can tell it seems to be from there that this spread. I’m sorry that it has become the crux of the story in the hands of the detractors and has caused your mother and family distress. I used that phrase too in my initial blog (which I wrote after reading your rabble piece) and also in my Journal piece. I know it’s highly emotive but I genuinely believe it’s an accurate word to describe the way in which the remains of those poor children were treated. It’s worth remembering (again) what President Higgins said: “These are children who while they were alive had rights, the rights to protection, and who, if dead, had the right to be looked after with dignity.” If not for Catherine Corless, we (and the President) would never have known of them. Like you, I am aghast that the nay-sayers have seized upon one word in their efforts to obfuscate and downright lie. Like you, I am terribly sorry for any upset caused to Mrs Corless and her family. Where the heck are those 796 dead children buried at? While the “septic tank” story did a massive disservice, and words were put in Corless’ mouth as to “dumping”, the Bon Secours sisters (the nuns who ran St. Mary’s Home from 1926 until 1961) gave death records to the Tuam registry office – but they have not given written, tangible proof as to burial records. Neither they, nor anyone within the Roman Catholic Church has offered written, tangible proof as to burial records – burial location(s). If a detective went looking today for even 10 dead children and was given death records, but not burial records for the 10, but was told that all 10 were buried under a lovely memorial stone and that he should just take their word for it —- you can bet that heads would roll —- and that he, a prosecutor or a gov’t entity, would exhume the place to make sure that all 10 were indeed buried there. Thank you for the clarifications. I have been following this story, and truly appreciate the story your family has told. The truth is the best medicine for healing but doesn’t always taste so good. I am not Irish but have been following this story closely. I am the single mom of a two year old girl. She was born “out of wedlock” and her dad is Irish. Ever since her birth her father and his Irish family have decided to refrain from acknowledging this child, a part of their family and blood. I firmly believe their neglect is connected to the legacy and histories suffered by the Tuam babies; narratives born of shame inflicted by the austere bigotry of a stern form of Catholicism which cowers in the face of what it considers “sinful”. I am glad the stories of these voiceless souls are being unearthed; I am happy the voices of these innocent children and mothers are finally being -somewhat- heard. In the name of love, in the name of their beautiful and silenced souls; In the name of my daughter, I send my regards to you and your mother with respect and infinite gratitude. Hi Adrienne, None of the sniping and obfuscation can ever detract from the amazing work your mother has done, and the voice she has given to all the mothers and children who are still suffering from this awful time in Irish history. All the stories coming out are speaking to my heart….as an orphan and adoptee, albeit in far less harrowing circumstances. I wrote a blog about the lasting impact of never feeling you belong anywhere, or even have a right to be here….and then managed to delete it all…Aaaargh! I’ll write it again…..when i can. Seas an fód – there are more people with yez than agin yez. Adrienne Corless sets the record straight with the Paper of Record. A must-read. Enjoyed that read Adrienne. Forgot how strong a point you can make and how well you can do it! We have to cast doubts on findings or important questions would be left unanswered. All in all, while Mrs. Corless is doing her PTA part to get a plaque for children, real historians want answers. She’s confusing basic facts and that’s frustrating. Hi Morgan, did you read the piece above with the scrutiny of a “real historian?” The confusion was not wrought by Mrs Corless but by other reports – perhaps with that exact motive of “casting doubt”. That is frustrating. The basic facts are outlined painstakingly above. “real historians” we are all historians, we tell our own story from our own perspective which is as relevant as anything real historians have to say, we all have a story to tell………..
Why are people debating over whether the word “dump” (as in the bodies were “dumped”) is appropriate? Did the babies get a proper funeral and burial? No, probably not. So why WOULDN’T “dump” be a proper word? Are these people even human? Indeed…where are the 796 dead children buried at? While the to the Tuam registry office has the death records, neither the Bon Secours sistrs, nor anyone within the Roman Catholic Church, has given any written, tangible proof of burial records – burial location(s) – for the 796. If a detective went looking for even 10 dead children and was given death records, but not burial records – locations – but was told that they were all buried under a lovely memorial stone marker, you can bet that heads would roll, and that he, a prosecutor or a gov’t entity would have that place exhumed to see if any, some or all were indeed buried there. While we don’t know if any of those poor children were used in medical research when they passed away, it has come to light that hundreds across Ireland were used in medical research when they died, and that none of them have any names, age at death, or gender to identify them. I’m curious if the Sisters have been questioned and have they produced any more definitive info about the location of all the poor children who died while in their responsibility? Well done and well said! I heard your Mum on the Joe Duffy show, and read the ensuing sensationalist headlines. I often turn to Irish Times for truth and balance but was dismayed by Rosita Boland’s article that absolutey did not ‘fit’ with the video evidence on the same page..Shame on the Irish Times and boo! hiss! to Rosita Boland. Your Mum is a brave and excellent researcher . Well done to her for highlighting this and not giving up over the years. Ireland owes her a debt of gratitude! Thank YOU for this wonderful and incisive response ! Adrienne, I know it’s hard not to take bad journalism to heart but try to remember this. Most modern journalists are in the job to be celebrities and not to tell the truth or even give their opinions, they’re little more than gossip columnists! The level of grammar mistakes, misspellings and contradictions in most news reports is scary and I’m often surprised that most can even spell their own names. If you give them a simple black and white story they can just about follow that, but when you give them a nuanced complicated story whit lots of shades of grey and no real answers you might as well shout at the wall for all they’ll understand. Then they get frustrated and start blaming everyone else for their inability to understand it. You’re mother has done great work telling the story of the Tuam home and after all is said and done that won’t be forgotten. It seems like the Times is pissed off that they didn’t get this story. And if it didn’t come from them, well it must be flawed; if it was shocking, then it couldn’t be accurate. It smacks of media snobbery and begrudgery and denigrating the thoroughness of your mum’s research is the only angle they have on a story that should be championed. Thanks Adrienne for a calm, measured statement under such difficult circumstances. The dignity your mother and the family have displayed is in marked contrast to the behaviour of official Ireland. The nation should be profoundly grateful that some people have shown a generous and caring aspect of the country’s character. Your mother has done valuable & important work, and has done a service to this nation. But we also have to acknowledge the lurid (& and untrue) media headlines that have went all around the world. I have read some media reports, from several different countries, of ”800 skeletons being unearthed’. Some media reports have likened Tuam, to ‘the killing fields’ of Cambodia, Rwanda or Scebernica. – a ‘crime against humanity’ or a ‘genocide’. The ‘Irish Star’ newspaper published photos of huge piles of bones and skulls, from the war graves of Cambodia, and implied that something similar had been found at Tuam. They seemed to imply that 800 children were deliberately killed, and disposed of, all at the same time – rather than a over a forty year period. Unfortunately once these headlines have gone around the world, the damage is done. It becomes almost impossible to retract, and to re-establish the full facts and clarity. For the media to grossly sensationalise the story in this way, does no justice to your mother’s years of hard work and efforts to uncover the truth. I respect your mothers research, and how important it is to our country – and our understanding of our history. But the media sensationalism is only distorting the story, and ultimately, only undermines her important work. Where then are the 796 dead children buried at? While death records were given by the Bon Secours sisters (the nuns who ran the Home until 1961), neither they, nor anyone within the Roman Catholic Church, has given any written, tangible proof of burial records – burial locations – as to where any, some or all of the 796 are buried at. If a detective went looking for even 10 dead children and was given death records, but not burial records, but was told that all 10 were buried under a lovely memorial stone marker, you can bet that heads would roll, and that he, a prosecutor, or a gov’t entity would have that place exhumed to see if any, some or all were indeed buried there. The RCC employed ‘The Communications Clinic’ PR company for to cover the tracks of the Bon Seccour nuns. That PR company is co-owned by Tom Savage, who was (once a priest, always a priest) a RCC priest. That same Tom Savage is Chair of the RTE Authority. What work has that PR firm done for the nuns? What strings have they pulled in the media? How many Opus Dei members are in positions of ownership and influence in the media? That is why there was an obsession to dilute the matter and deal with details, in the hope that the matter will be forgotten by the public. I will not forget it and I hope that you will not. Catherine Corless is an example of what is rare in this religion infested country of ours—–courage. Absolutely brilliant. Isn’t it amazing that bloggers are doing a better job of telling this story than major newspaper journalists? Hooray for you, Kimikaze. and other bloggers!!! Have you contacted Rosita Boland for some explanation? Since this post was published, Rosita Boland has written to Adrienne Corless pointing out that her original article quoted Catherine Corless correctly and offering audio proof. For the information of readers, the letter sent by Rosita Boland to Ms Corless appears now under the original article, here: http://www.irishtimes.com/news/social-affairs/tuam-mother-and-baby-home-the-trouble-with-the-septic-tank-story-1.1823393. It appears you haven’t actually read the original entry here, *or* the update today. Thank you for responding to what seem to be the consistent attempts to gloss over what happened at the mother and baby home in Tuam. I am disappointed that even the Irish Times has gone down this road. Your mother’s work on this issue has been wonderful, without her we may never have known what happened to those children in Tuam, or other homes, and the State’s disregard for Ireland’s most vulnerable citizens. The link to the fund page doesn’t work. You and your mother should be equally proud of one another. Both so eloquent, even in the face of such adversity. I would like to be able to contact your mother to find out if my ex-husband (deceased) and father of my 2 sons came from one of these homes. To me it seems a hopeless task but I thought I would ask. We do not have any information about him at all except that he was supposedly born in Hoboken NJ USA in 1952 with the name Dennis Drummond. I have not been able to find any information about him in the USA and after reading the articles about Tuam wonder if he was born in Ireland. Thank you. Hi Linda, I will check with her as to the best way to get in touch with her.